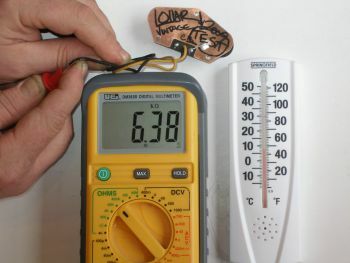 We decided to further demonstrate an important property of guitar pickup DC resistance. 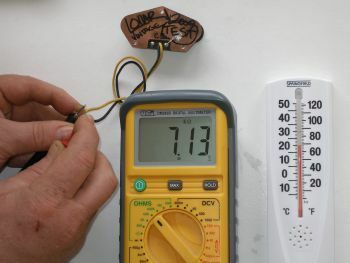 That is, how temperature can affect the DC resistance reading on the SAME pickup. So we did a simple experiment for you. This will help demonstrate the point. We took the SAME pickup, a 2009 Lollar Vintage T Series bridge, and placed it in three different temerature settings and photographed the results. 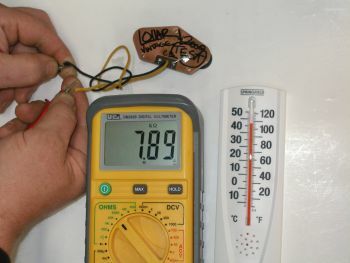 As you will see, the same pickup will have different Ohm meter readings when the pickup’s temperature changes. This particular Lollar Vintage T Series bridge reads a little over 7.1K at 68 degrees fahrenheit. Here you will find our stock Lollar Vintage T Series bridge (one of our most popular, by the way). The DC resistance is taken at room temperature, as indicated by the thermometer. This same Lollar Vintage T Series bridge has a reading of almost 7.9K after it has been warmed up for about an hour. Now this same Lollar Vintage T Series bridge has a reading of just under 6.4K - it has been sitting in the refrigerator. This final photo shows how a colder temperature affects the DC resistance. We let the same Lollar Vintage T Series bridge pickup sit in the refrigerator for about an hour. You can see how lowering the temperature of the pickup also lowers the DC resistance reading.